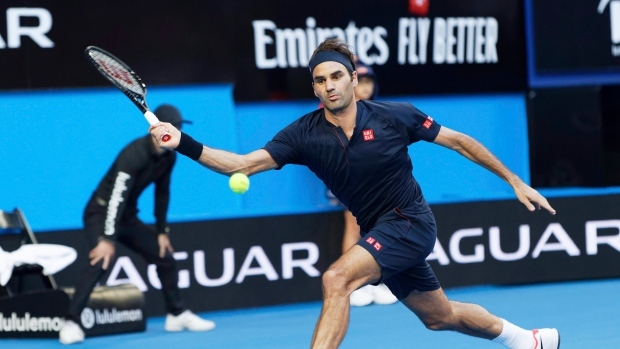 PERTH, Australia — Roger Federer started preparation for his Australian Open title defence in style with a 6-1, 6-1 victory over Cameron Norrie at the Hopman Cup on Sunday. The 37-year-old Federer sent his 23-year-old opponent from Britain back to reality in a one-sided match lasting just 57 minutes. The No. 91-ranked Norrie had defeated Greece's No. 15-ranked Stefanos Tsitsipas in straight sets on Saturday in one of the biggest victories of his career, but was outclassed in his first match against Federer. "This was a great start but obviously a long way to go here and in Melbourne," Federer said. "It's nice that I'm feeling as good as I am and played a wonderful match against Cameron." Federer started the match nervously and dropped the first three points, but dug out of a hole with trademark clutch serving. He discovered his groove by dominating Norrie's serve and broke in the second game with a powerful cross-court backhand winner. Federer moved the British player around by crisply hitting the lines as he won five games in a row to take control of the set. Norrie saved two set points in the sixth game to get on the scoreboard and earn applause from the near capacity crowd. Norrie seemed momentarily inspired as he gained two break points before Federer once again recovered to close out the first set in 31 minutes. The 20-time Grand Slam singles champion broke immediately in the second set and looked sharp as he cruised to an easy first-up victory in the tournament as defending champion Switzerland went on to beat Britain 3-0 in Group B.
Belinda Bencic defeated Katie Boulter 6-2, 7-6 (0) in the women's singles to clinch the match before Federer and Bencic teamed up to prevail over Norrie and Boulter 4-3 (4), 4-1 in the mixed doubles in the Fast4 format. Federer's appearances at the past two Hopman Cups laid the groundwork for successful Australian Open campaigns. Earlier, Angelique Kerber and Alexander Zverev gave Germany a 3-0 victory against Spain. Kerber ended a five-match losing streak against Garbine Muguruza with a 6-2, 3-6, 6-3 win. No. 4-ranked Zverev beat David Ferrer 6-4, 4-6, 7-6 (0) in the men's singles match before the German pair combined to win the mixed doubles 4-2, 4-3 (3) in the Fast4 format. Also in Group B, the United States plays Greece in the only match on Monday.